A few months ago, I decided that I wanted to make the guest bathroom my 'holiday' bathroom. My husband thinks I just wanted an excuse to redecorate it every month. 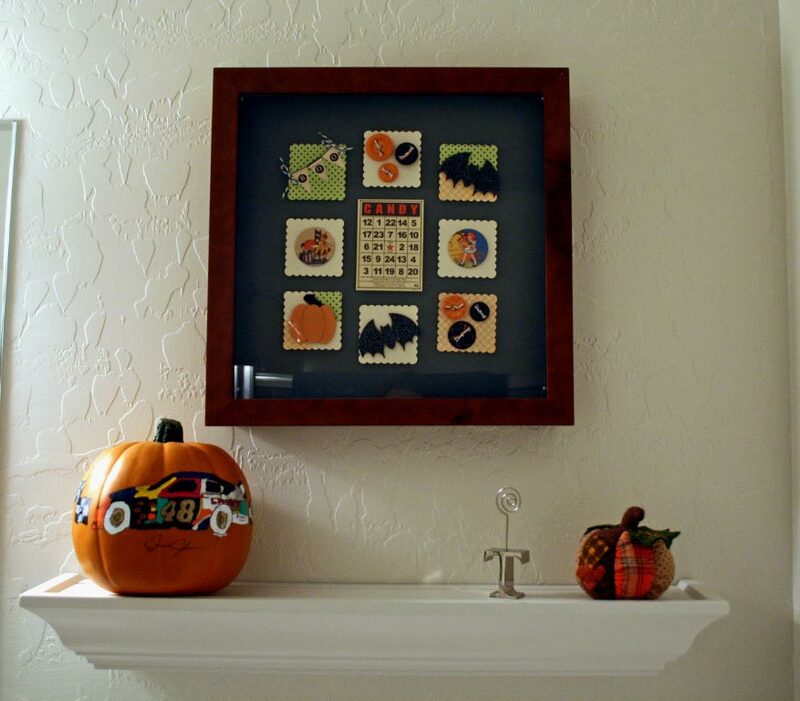 LOL I asked him to add a shelf for some accessories, and then I found a shadow box frame and plan on making something different to hang in it every month. 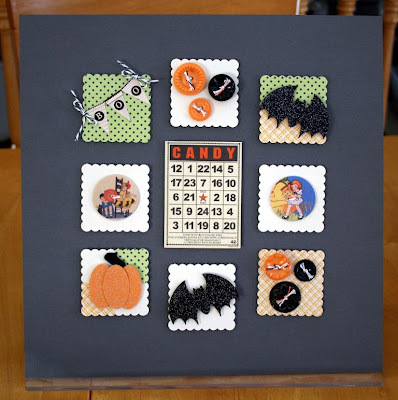 I KNEW that the JBS bingo cards would work perfect as a centerpiece. I punched plain cardstock for the squares surrounding the card, and added some patterened paper from the 4x4 mini packs. 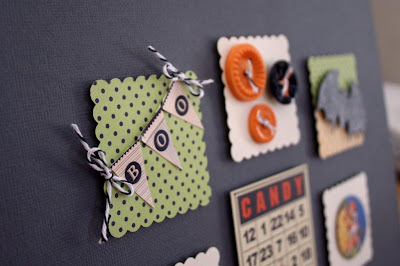 I couldn't resist the new Halloween chipboard buttons and added a few in there. 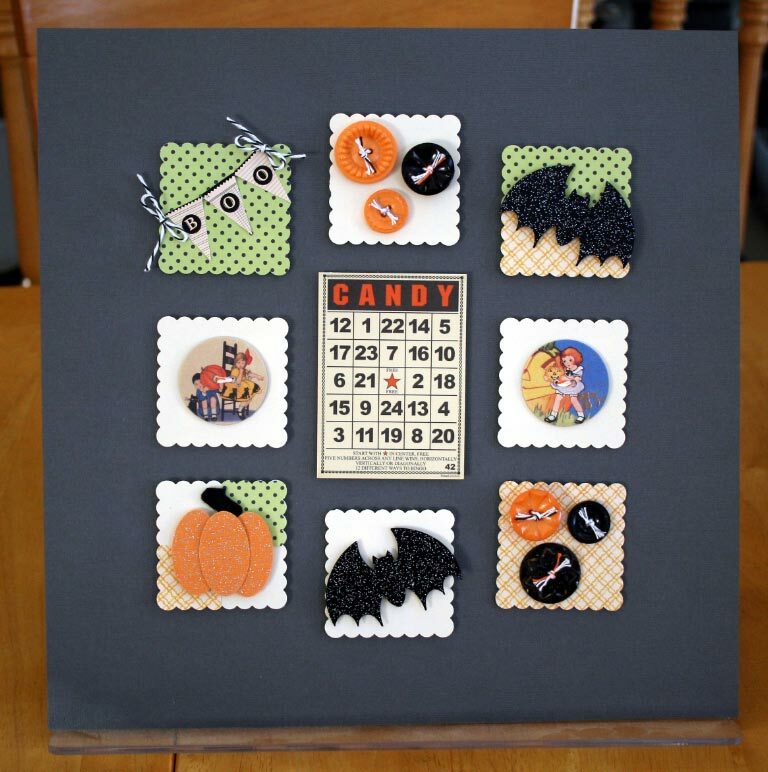 I finished it off with some of the vintage buttons and halloween shapes punched from glittery cardstock. the pennant stickers also worked perfectly, finished off with a bit of baker's twine. I can't wait to make more-Maybe they will pop up in a future post. :) Thanks for inviting me to contribute!! Oh the CUTEness! Thanks for the inspiration Bridgette! Very fun guest bathroom decor! I also love Danielle's and Shimelle's creations. Go girls!